How to avoid making chewing noise while eating? 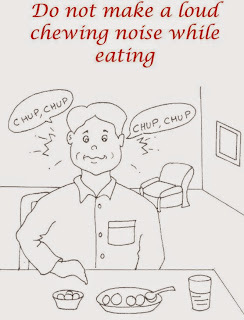 One of the main problems while eating food with the family members or group of friends or colleagues is smacking, chomping or crunching noises that one makes while eating. Crunchier foods like chips or salads make the loudest of noise while eating. It won’t be wrong to say that eating loud is very annoying for others. So, in case if you are the one who makes noise while eating, you have to put extra efforts to hold on to noise. This post will talk about do’s and don’ts while eating to avoid the louder noise while eating. First of all it is important to become conscious while eating to make sure the others are not getting disturbed because of the noises that you make. If you are mentally conscious enough of the noise you make while eating, you will automatically put the extra effort to control it. So, foremost thing to do is to be mentally aware that you are eating quietly in order to avoid disturbing others. I have listed down few important tips that can help you, to the great extent, to minimize the noise while eating. Eat with closed mouth: If you wish to irritate your partner, eat food with open mouth. Eating food with your mouth open has dual effect to irritate others: One with the noise you make while eating and other when they see inside your opened mouth. Both of these things are good enough to put your partner down. Well, but otherwise, it is horrible to eat with your mouth open. Make every effort to change this. Eat with closed mouth by all means. Also eating with closed mouths helps in controlling the noise you make while eating. Smaller pieces: Take smaller bytes while eating. There is no point to take the bigger portion than what you can handle. Eat Slowly: Apart from taking the smaller portion of food, it is important to eat slowly. Chew your food as slowly as possible. This will make sure the noise that is made is less as compared to when you eat fast. Also chewing your food completely and slowly has the benefit of better digestion thereby keeping you healthier. Gap between two bytes: There should be couple of second’s gaps between two bytes. Let your first byte is swallowed completely before you reach for another byte. Another benefit of keeping a small gap between two bytes is to let your body tell you if you really need another one. If you are full, your body will communicate to you before another byte has taken. Hence overeating can be avoided with this small but effective technique. Concentrate on food and not on conversation: This is again important to have your complete focus on eating food and not on conversation happening over the table. In fact you should ask your team mates to stop talking for their own good. All the discussions and conversations can happen after eating. Don’t touch tongue with the roof of the mouth: Avoid slapping your tongue with the upper portion of the mouth. This will prevent you from making irritating noises. 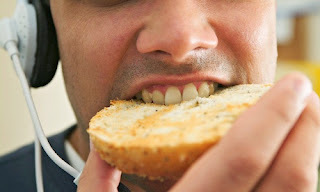 Eat with the back teeth: Eating with the back most teeth also helps in making the minimum noise while eating. Do you make louder noises while eating? Is there anyone in your family or friends who has suffered from this situation? How have you dealt with it? Do share your experience with our readers. Good input, people learn how to eat without making noises when they are taught in infancy!